It’s the second week of the National Flawless Day countdown! From October 10 to 16 at all Flawless clinics nationwide, avail of the Forever Clear selection for up to 40% off. The Forever Clear collection consists of the Oil Control Kit, which is a collection of skincare products that will help in minimizing pores that are common to oily skin, and the classic facial to improve your skin. The Forever Clear collection also contains the Ultra Acne Therapy Package, which speeds up the healing time of acne, and the effective warts removal package, which uses the painless electrocautery to remove warts, seborrheic keratoses, cherry angiomas, pyogenic granulomas and skin tags. Last on the Forever Clear collection is the incredibly popular Nano Powerpeel, which uses exfoliation by corundrum crystal to reveal youthful and beautiful skin underneath. Also included in the celebration is the popular Pick A Prize contest. You get to walk away from Flawless with clear and youthful skin and a prize to boot! For inquiries please call 6879118 or 5846807. Like us on Facebook (Flawless Face and Body) and follow us on Twitter (MyFlawless)! If you're battling acne, want to maintain a recently healed acne problem or just plain wants those warts zapped and gone, then this week is indeed for you! The Forever Clear collection is really ideal for most Filipinas who are dealing with minor to full blown acne problems, as well as those with oily skin. I think this is something that no one should pass up given how expensive treating acne could be. I personally have tried their Nano Powerpeel and I was happy with the results. Getting rid of acne is one thing but getting rid of nasty dark scars is another. 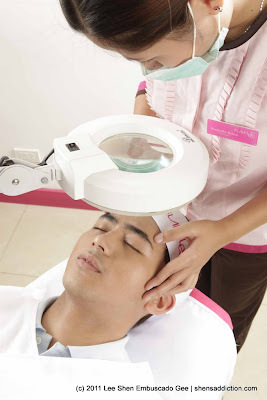 I already saw good results with just one Nano Powerpeel session. It has also lessened my oily skin for good 2 weeks. I'm definitely recommending any of the treatments that Flawless have in promo this week. It's an amazing deal that will not only save your skin but also save you extra money for more important things. Take advantage of the Flawless Forever Clear Week now!